Wow! It was cold, but we had quite a few scouts attend, and made some great progress on cleaning up the trail. We even had some siblings and at least one Girl Scout with us! Way to help our community Scouts! You should already be signed up if you are to have a BOR. Contact Ms. Haymes at 131Advancement@gmail.com if this is in question. Well, it doesn’t look like there is enough snow for Quinzees, so plan A is to go PW Forest park and go on a hike, and maybe even a fire building competition!! We’ll keep monitoring the weather to see if we can go to Canaan Valley instead! Colonial District Merit Badge Jamboree is February 2, see below link to sign up! Hello and best wishes to everyone. We will begin collecting 2019 Troop 131 Dues at tomorrow’s meeting (January 28th) and again at the February 11th and subsequent meetings. Please plan to attend one of the meetings or send a dues payment with your scout. The WSJ is this summer at the Bechtel Reserve in WVA. If you would like to visit for a day, see below link. We’ll talk about the possibility of taking a group. The Google calendar (see link at the bottom of the page) is updated to reflect the Troop Calendar sent out before Christmas. If you have any service opportunities you think would be good for our Scouts, please contact Mrs. Greiner, our Service Coordinator at 58donahue@cua.edu. – BRING YOUR COATS! It is winter, it’s cold, we go outside for activities. Be Prepared. – CELL PHONE USAGE – Not in the troop meetings, except with very few exceptions when they are being used for advancement or merit badges. – Uniforms and Opening/Closing Ceremonies – wear your Field Uniforms and line up properly for the ceremonies. – BRING YOUR SCOUTBOOKS TO THE MEETINGS! Opportunities for Advancement are being wasted just because Scouts don’t remember their books. Contact Mr. Steenstra at the troop meeting if you would like to be on it! There are lots of great opportunities around the area. 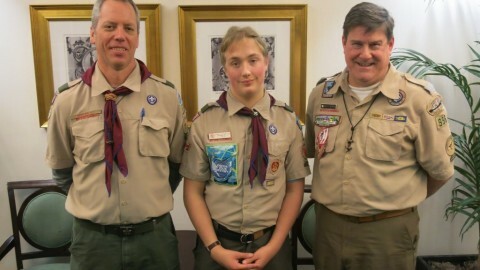 Congratulations to Alexandria’s newest Eagle Scout. This Week (Jan. 13): Cook-off, Skiing, Merit Badge JamboreeCongratulations!